Keeping to schedule and minimising lane closure time is imperative for all highways maintenance contracts, and nowhere more so than on the M6 in the Midlands, one of the busiest stretches of motorway in the UK. 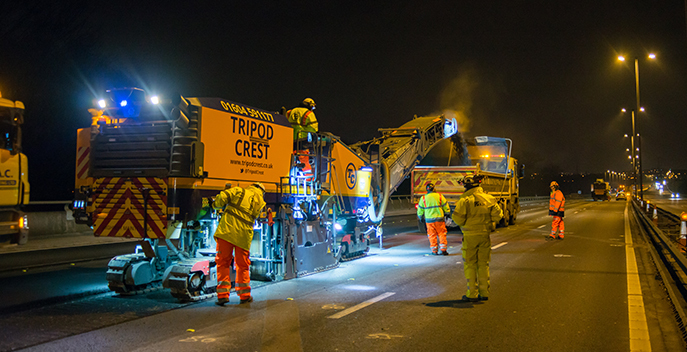 Tripod Crest was recently involved in a weekend scheme on the Rushall Canal and North East Spur bridge decks between junctions 7 and 8 of the north bound M6 motorway. The works were located within lanes 2 & 3, while lanes 1, 2, and 3 were resurfaced to improve the deck pavement longevity. The decks were cold milled down to the concrete layer to remove existing waterproofing treatment before Aggregate Industries continued their work to strip off the remaining surfacing and waterproofing materials. The bridge decks were then inspected and tested with the findings recorded. Any essential deck repairs were undertaken and then the decks were re-waterproofed, resurfaced, and the carriageway had the road markings replaced prior to opening. Following this the bridge joints will be renewed. The above scheme required extensive planning on the part of Highways England and their Area 9 Asset Support Contractor Kier Highways, together with the involvement of their direct supply chain, in particular Aggregate Industries, CLM, USL, Chevron and WJ. The works were carried out from the night of Friday 23rd February. The carriageway was re-opened for traffic on Monday morning. As a key supply chain partner to Aggregate Industries, we deployed a significant level of resource to undertake this task, which was managed by our senior supervisor Nigel Summers. We removed approximately 540 tonnes of the existing carriageway within a very short time window on Friday night to allow the next operation sufficient time to complete the bridge deck preparation and waterproofing activities. Three of our 2.0m planers and 15 Tripod Crest operatives carried out the Friday night works. A 2.0m planer was also used on the Sunday to undertake other associated tie-in works. We were supported by our supply chain, including MAC Contracting with 27 tippers and Go Plant who provided three sweepers.